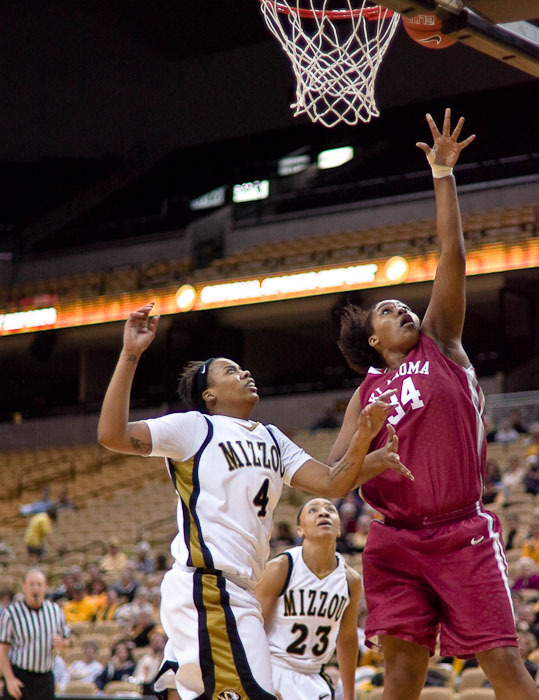 Missouri women’s basketball forward Jessra Johnson, left, fails to prevent Oklahoma’s center, Abi Olajuwon, from making a two point shot on Wednesday, 20 Jan. 2010 at Mizzou Arena in Columbia, Mo. Olajuwon wears the same number as her father, Hakeem “The Dream” Olajuwon, from his college career. The Tigers lost 61-62 to the Sooners. | Canon 1D IIn and 50mm f/1.4 lens; exposed 1/1250 sec. @ f/1.4, ISO 800. | Color corrected with X-Rite Color-checker Passport. Maybe you’d just take two identical bodies and figure no one will notice the difference once its printed on Charmin, any ways. But online, the differences can be stark. Take, for instance, this Columbia Missourian slideshow where I was using my 7D and a 1D Mark III on loan from CPS, but my colleague Chris Dunn was using an older D2Xs body at the football game between MU and Kansas State. This is an extreme example, but it is amusing to watch Kansas State’s jerseys suddenly jump from purple to blue depending on which camera was used. Hint: Nikon didn’t figure out what purple “looked” like until the D3 and D300 came out. After posting my brief comparison of the color gamut displayed by the Apple 24″ LED Cinema Display and the Hewlett-Packard 24″ LP2475w, I was asked if the comparison was fair as the computers used to build the profiles of the two monitors were different. While the only piece of hardware that truly matters when comparing the profiles built is the display adapter (video card), this component was, indeed, different between the HP laptop and the MacBook Pro. 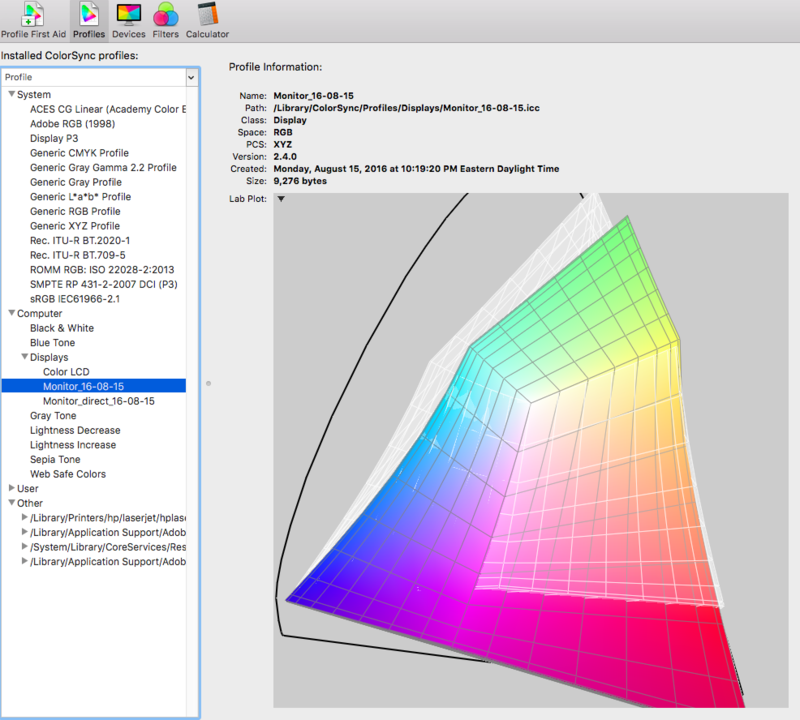 In addition to comparing the color gamut of the monitors to the Adobe RGB color space, which is used by many digital SLR cameras, I was also asked what ramification viewable gamut had on printing using Epson 4000 and Epson 4800 print engines. I compare the gamut viewable by the monitors with Epson’s ICC profiles (for both printers) of Enhanced Matte Photo Paper and Premium Luster Photo Paper, both of which now have strange names: Ultra Premium Presentation Paper Matte and Ultra Premium Photo Paper Luster. The equipment used for this comparison was a MacBook Pro v3.1 (with a DVI connection) with an nVidia GeForce 8600M GT video card, an Intel Core2Duo 2.2 GHz processor and 2GB RAM running OS X 10.5.8. 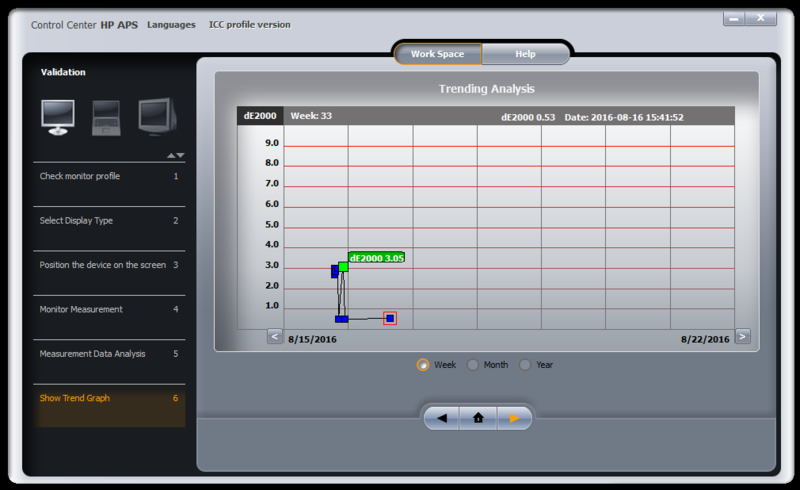 The calibration unit remained the same as in the previous comparison: a Gretag-Macbeth / X-Rite Eye One Pro spectrophotometer. Unlike the laptop used for the previous comparison, the DVI connector meant that there was no obvious way to connect the MacBook Pro to the new Apple 24″ LED Cinema Display, which has only a “Mini DisplayPort” connector. To overcome this problem, an Atlona AT-DP200 Mini DisplayPort to DVI adapter bridged the gap between the monitor and the laptop. So long as an older style MacBook is plugged into the monitor with this adapter–and the USB cable from the monitor is also plugged into the laptop–the user has complete control over resolution and brightness. There are no color controls, unlike the HP monitor, but this has been true of all cinema displays from Apple over the past few years, and that did not stop many a PC user to purchase an Apple screen. 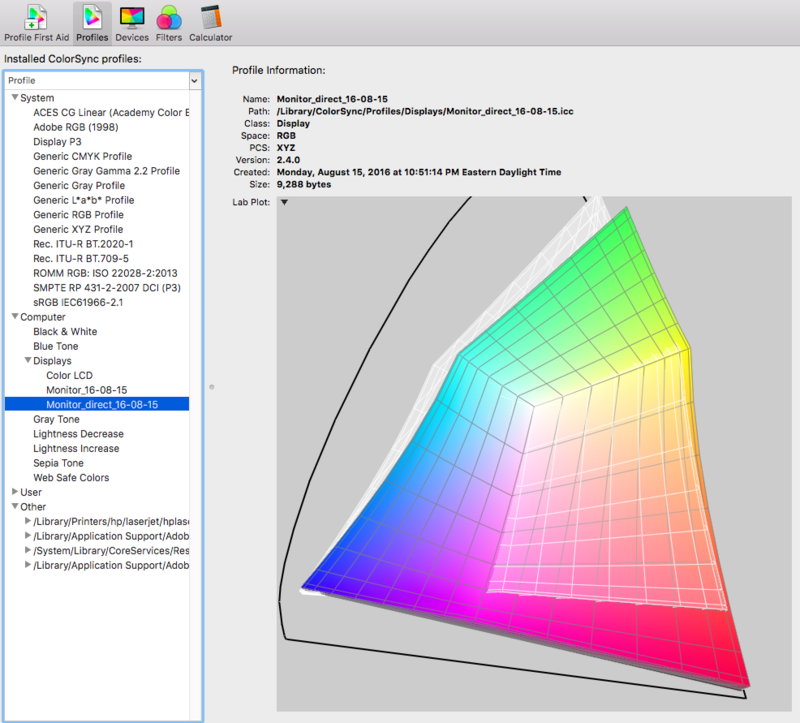 The ICC color profiles created by the Eye One Match 3 software were then compared using a trial version of Gamutvision 1.3.7 with a rendering intent of “None” on a two-dimensional XY Chromaticity (saturation map) projection. I really don’t review many products except those that I own and use. 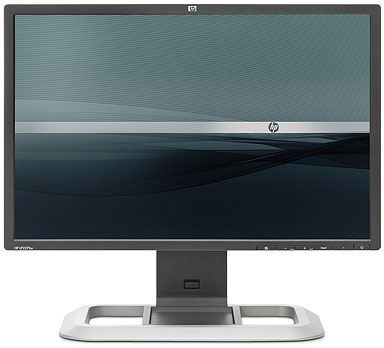 However, an opportunity arose at the University of Missouri to compare, side-by-side, the Apple Cinema LED monitor (selling for $860) with what has been my workhorse monitor over the past year, the Hewlett-Packard LP 2475w (selling for $550). (You can read my earlier review of that monitor here.) Physically, there are a lot of differences between these two monitors, and one of those differences might actually play a role in performance. The Apple monitor has no buttons, and can only connect via “Mini DisplayPort,” which is currently found only on the latest Mac products. I can only surmise that Apple and its shareholders were sick and tired of the entire world of photographers on budgets buying their screens, and making money for the company. </satire> Furthermore, the lack of a menu in which one can control brightness, contrast, and the red, green, and blue outputs is sorely lacking. As of August 2009, this monitor has fallen in price to a very attractive $555.00 at Amazon . I mention this because this remains one of my most popular reviews, and if you decide to purchase this monitor, and found this review critical to your decision-making process, I would greatly appreciate it if you would click on my link to complete the sale . Alternatively, the monitor is available at B&H. Thank you!